Don't pass up dessert! Even if you are vegan or trying to eat healthy there's no reason to deny yourself sweet treats. 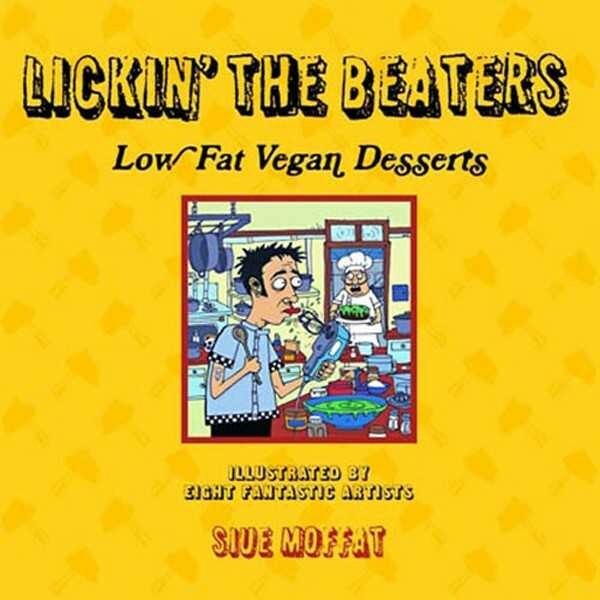 Lickin' the Beaters brings you over 80 fabulous low fat, dairy free desserts where even the second helping is guilt free. Don’t pass up dessert! Even if you are vegan or trying to eat healthy there’s no reason to deny yourself sweet treats. Lickin’ the Beaters brings you over 80 fabulous low fat, dairy free desserts where even the second helping is guilt free. Breads, cakes, donuts, candies, cookies and bars, pies, ice creams, puddings, toppings, fruity stuff, drinks, and a whole lot more. Illustrated with beautiful linocuts and zany cartoons, you’ll find the recipes fun, easy to follow and so good you’ll eat half the batter. Written by Siue Moffat with Illustrations by Allyson Mitchell, Daryl Vocat, Missy Kulik, Five Seventeen, Brenda Goldstein, Jonathan Culp, Joe Ollman, and Zoe Dodd. Siue Moffat is a dessert lover like no other who went vegetarian at 14. She occupies her time cooking, baking, making short films and fanzines, stressing about the state of the world and looking for film archiving work. PM Press will also publish her second cookbook, Lickin' the Beaters 2: Vegan Chocolate and Candy in 2008.